Complex problems require complex solutions; and a virus as multifaceted as HIV begs a multifaceted approach to understanding, resolving, and hopefully one day, curing. The UTC Transmits event addressed this complex issue, covering everything from the makeup of the virus itself; to the medicines which are being used to treat it; to the effects that it has on people living with the virus; and preventing it from spreading. 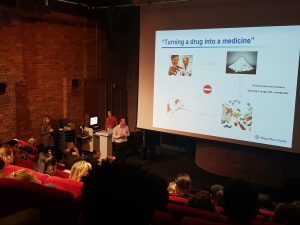 This is the second HIV seminar programme to take place in the UTC, which is unusual – it’s the first topic which has been revisited, and it’s simply because so much has changed in the five years since the first seminar on HIV. There have been such profound advances in this area of research, that the UTC decided to bring its original line up of speakers to take to the stage and discuss what’s changed. Although there have been drastic changes in the way people are living with HIV in affluent areas of the world; there is still a major international barrier to development for those living in pain and poverty around the world. One of the biggest issues surrounding HIV is the stigma it carries with it. As HIV Prevention Week takes place across the UK, with advocates such as Prince Harry and many UK universities encouraging people to ‘Give HIV the finger’ and get a pin prick finger test; the students at the UTC are hard at work discovering more about the disease and how to combat it completely. “HIV is not a disease – HIV leads to a range of diseases and infections,” says Professor Bill Paxton, from the Institute of Infection and Global Health at the University of Liverpool, as he opened the seminar. 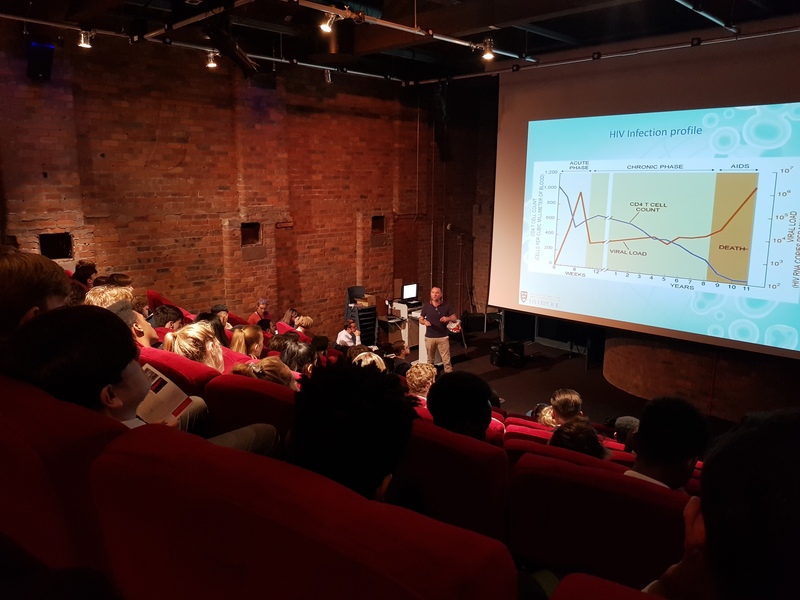 Speaking to a packed auditorium of year 12 students, Paxton’s experience working to understand and prevent the virus is evident, as he introduced the students to the complexities of the viruses ‘genetic makeup’. He also introduced the magnitude of the problem, “The HIV virus is not a living entity,” he says. “HIV cannot self-metabolise. However, one infected cell can make one million copies in 24 hours.” And it is for this reason that HIV is such a complex virus to fight; once the virus has mutated, it creates loops which protects the virus’s inner core, so antibodies can’t get in. “We’re desperate to make a vaccine, but we are nowhere near a vaccine because of the complexity and diversity of the virus,” he says. Next to take to the stage, and to talk specifically about the HIV medicines that have been created so far, is Dr Johnathan Brown, principal scientist at Bristol Myers Squibb. Brown talks about the complex processes involved in turning a drug into a medicine and how creating a medicine is only one part of solving a much bigger picture. “Chemists understand how the virus works, and replicate the structure of the proteins, designing proteins to bind to the HIV molecules,” he says. However, he warns that it’s not as straightforward as it might seem. Part of a chemist’s role is the understand and pre-empt patient compliance – if a drug is too complicated, too time-consuming or tastes too bad to take, many patients don’t take them – regardless of how lifesaving it might be. “Just one dip in taking medicine correctly, opens a window and provides an opportunity for the virus to develop a resistance,” he warns. Dr Mas Chaponda joined us next. Chaponda is a consultant HIV physician at the Royal Liverpool and Broadgreen University Hospital Trust, and he talked to the students about his work in a transition clinic in Liverpool, which treats those born with HIV, dealing with with mother to child transmission. One of the key messages that he delivered during his talk was that of the stigma of HIV, and how many women who transmit the virus to their children, find living with HIV difficult due to fear of being stigmatised by loved ones, and by the fear of violence towards them. He also talks of the difficulties that children face growing up with the disease. Other talks came from Dr Mark Lawton, consultant for sexual health and HIV at the Royal Liverpool and Broadgreen University Hospital Trust; and representatives from Merseyside’s HIV support service, Sahir House. Lawton, who has specialised in the field of sexual health and HIV since 2005, approached the topic of undiagnosed HIV, and tackling it in high risk groups. Sahir House puts a human face to HIV, developing peer networks to empower people living with HIV; the charity also provides education and training in order to tackle HIV’s associated stigmas. Sahir House brought a positive speaker along to speak to the crowd of eager future scientists. Paul Childs spoke honestly about living with HIV and the importance of finding a cure, giving students the opportunity to ask questions and understand more about the virus on a human level. 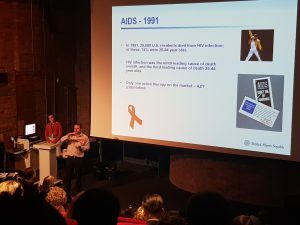 The UTC Transmits seminar approached the topic of HIV from all angles, giving a detailed insight into the virus and the real-life effect on the people living with it. It educated, encouraged and inspired the next generation of scientists to study the issue further, and hopefully, one day, eradicate it completely.